Sell software licenses and serial keys with WooCommerce. Automatically issue, validate and manage unique keys. Easy to use and integrate. Simplicity + Power: for users and developers. License management and serial keys can get complex. Users have to store serial keys and licenses, apply them at right places and not lose them. On the other hand, for the issuer / developer, generating and distributing keys as well as controlling unauthorized usage beyond permitted limits is a nightmare. They often end up creating complex systems. If you have multiple products, these is even a bigger problem. If you are distributing unique keys for any other purpose – group buying, offers, third party integrations – you need to not only generate keys and manage integrations, but also build the website for distribution. If you build a license management solution yourself or if you are stuck with a complex solution, you are wasting not only yours, but also your customers’ valuable, creative time. For all use cases of virtual and downloadable product distribution, software and memberships that require a unique key to identify a purchased license, this is the plugin of choice. It cannot be used for physical products. Use WooCommerce to sell your virtual and downloadable product, and use this plugin to issue, validate and manage keys. Simple: WooCommerce Licensing and Serial Key plugin is designed to be simple for both users and developers. Automatic: It automatically issues serial keys to customers on product purchase. Dedicated dashboard: Easily track each and every key’s status, edit key details, apply multiple search filters for managing keys. Import: If you have pre-generated keys, you can import them with a CSV file. This is the most simple and effective WooCommerce license manager. Earlier, WooCommerce Serial Key used to generate only one serial key for one product, irrespective of the quantity of the product. 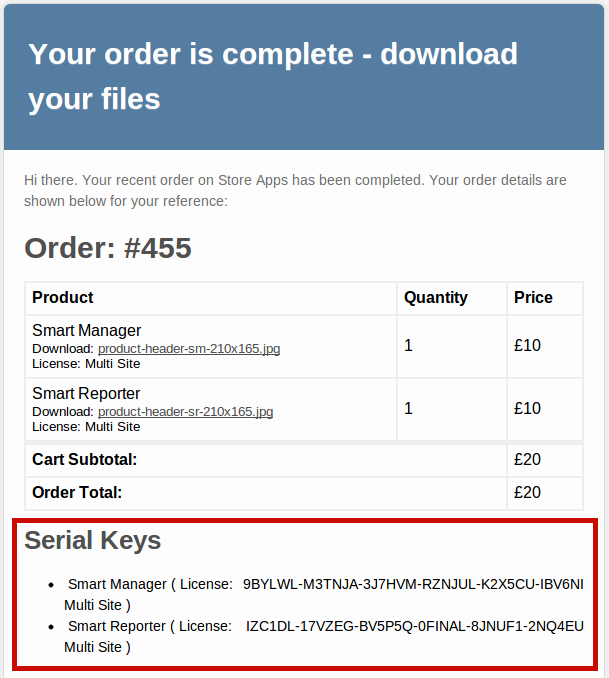 For example, if you purchased three quantities of Smart Manager, a single serial key would be issued for all the three. 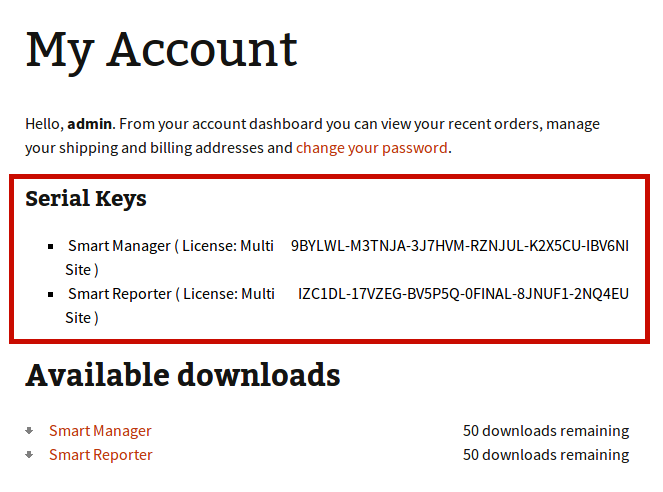 Now, if you purchase five quantities of Smart Manager, you would have five serial keys, one for each Smart Manager respectively. One serial key per Smart Manager respectively. When someone purchases a product, a serial key will be issued automatically. The key will also be available in their My Account area, and included in the order confirmation email. This example shows serial key validation – internally the system uses a UUID to identify the user (which can be their email address, domain name, or anything else you choose). We have a simple HTTP based integration API so you can add the validation routine in any system/software. See our integration documentation for more. You can setup license key issuance on any downloadable simple product or variation. If you’ve set an expiry for the product (number of days or downloads), the license key will be rejected once product access expires. Customers can manage their licenses from WooCommerce My Account area. For example, our plugins are licensed based on number of sites. As licenses are validated, those sites will show up in license management area within customer’s dashboard. If they wish, they can remove some sites to stop using the plugin on an old site, and activate it on a new site. 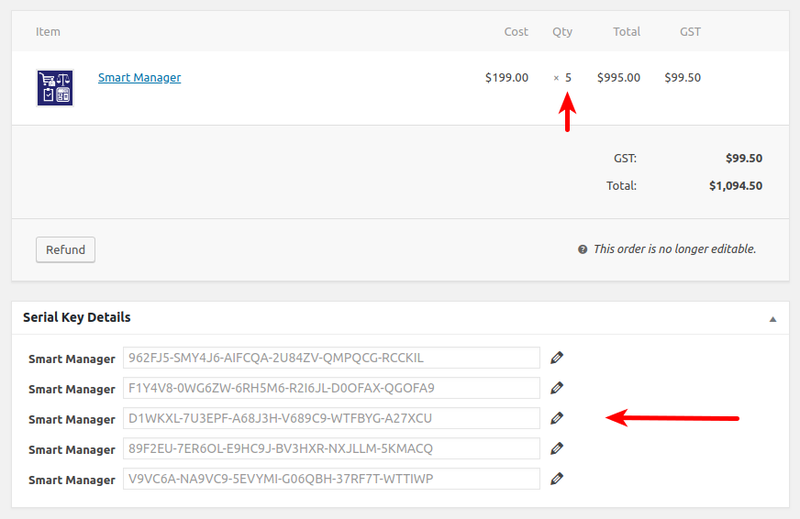 We’ve added features to WooCommerce so you can easily manage serial keys and orders. You can search for a customer order using a serial key, update serial keys in an order and even remove them. This will save you ton of efforts! You may also try out the Live Demo for WooCommerce Licensing & Serial Keys plugin. Simplify your license management today! You’ve invested a lot of time and energy building your products. Don’t let freeloaders and frauds jeopardize your business. Keep your products secure and let the money keep coming in. Go ahead and buy WooCommerce Licensing & Serial Key plugin. We will be ready to help with your integration.